In my novel, the night of "The Double Event" allowed an interesting opportunity for me to litter the pages with red herrings, false leads and pertinent information. It also meant that I would be able to bring several characters' plots to a climax. In fact, only a single, very short chapter separates the two murders and they are surrounded by a kind of crescendo as other story lines reach their tipping points. It was an exhaustive write. I was writing at the pace of about one or two chapters an evening for the first draft but I had opted to spend an entire day writing the story of that night, in hopes of adding a sense of continuity and pace. Throughout the course of the 29th of September, almost every character in the book interacts with another and a very subtle chain of events are put in motion to which everyone is involved. The end product had to be reworked several times but by the end of the evening, the story of the night had at least been birthed. From a a romantic breakup to a surprise kiss by way of an abortion, a revelation, a broken nose and basement sink stained with blood. One of the most memorable of such climaxes involves the discovery of what would come to be known as "The Goulston Street Graffito" and while I used my imagination to composite an idea of how it was discovered, the details of this clue are essentially accurate. The graffito itself was found near a scrap of cloth that had once been part of Catherine Eddowes' apron and had been drenched with blood and discarded upon the ground of a narrow walkway outside one of the district's largest Jewish tenaments. Speculation as to what this could mean has often escalated to wild flights of fancy, suggesting that the odd word "Juwes" was some kind of masonic code, rather than a semi-literate attempt at spelling "Jews" as part of an antisemitic slur. The use of a double negative in the phrase is actually a rather common feature of the cockney dialect, which may go some way to explain the true meaning of the message. (Are the Juwes to be blamed or not, in the writer's esteem?) 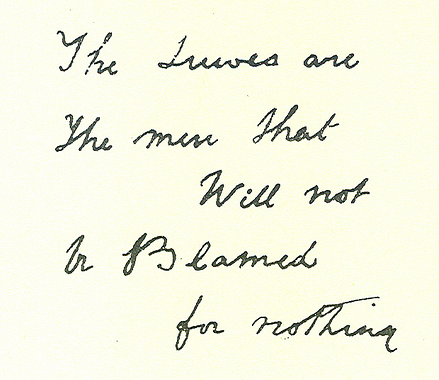 However, common parlance of the East End would suggest that the graffito could alternatively be written as: "The Juwes are the men that will not be blamed," or more directly, "The Juwes will not take responsibility for anything." The motive of the writer is impossible to distinguish from this coarse and confused statement, as is the length of time the graffito had been present when it was found. One could walk down any street of Whitechapel and find equally offensive, misspelled, anti-Jewish invective, particularly around the domiciles of the district's Jews who no doubt had to face this kind of hostility (and worse) everyday. Whether the writing was from the hand of Jack the Ripper, or from some other resident of the district who thought himself wronged by a Jewish person, will never be known. But in a case that fosters so much interest, yet where clues are so few and far between, it is impossible to read those words and not wonder what the writer meant, who he was and perhaps, that they could have had any idea that the nasty piece of hate they were scrawling on the wall of a building, would still be discussed over a century into the future. P.s. There is one more thing I wanted to add to this post which is only tangentially related to 1888. Today marks the day on which my grandfather died, after succumbing to the cancer he had been living with for many years. With him, our family loses its oldest member and I lose my final grandparent. Harold Stone was born and raised in the East End. His school was built next to Mitre Square, a few years after Catherine Eddowes was murdered there. While this is, of course, very interesting to me, the role Harry Stone would truly play in history came in the second world war, when at the tender age of 18, he enlisted in the navy and found himself fighting for the allied forces during the hellish battles that would come to be known as the Normandy landings. The awful scenes he saw there were not ones he liked to dwell upon, and it was several decades before he spoke to anyone in our family about what had happened. It was that same, quiet dignity that came to typify his generation, which allowed him to confront his illness with that sense of humble grace for which he can only be commended.